Fort Lauderdale Fire Rescue crews helped rescue a naked man who become stuck on top of an upright rail bridge in Fort Lauderdale Friday morning. Aerial footage showed the naked man atop the Florida East Coast Railway bridge located at 100 Southwest Second Street with crews below reaching out to comfort the man. According to witnesses, the unidentified man was walking across the railroad bridge around 8:30 a.m. when it began to rise, forcing him to scamper to the top. "The first crews arrived and noticed an adult male on top of fully extended bridge he was naked and appeared agitated," said Chief Timothy Heiser. 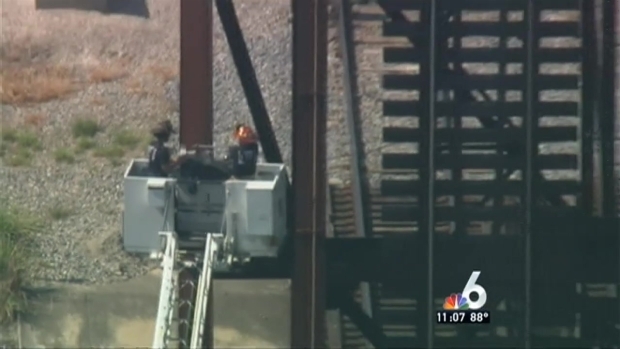 A naked man became stuck atop a Fort Lauderdale railroad bridge and had to be rescued. The height was too far for fire department ladders, so a member of the Broward County Sheriff's Office climbed the remaining distance and secured the man with a rope harness. Crews gave the man a white towel to cover himself with, and slowly lowered the bridge bringing the man back down to safety. He was taken to a nearby hospital to be treated for burns he suffered from the hot metal and observation, officials said. Two years ago, a woman became stuck on this same bridge. 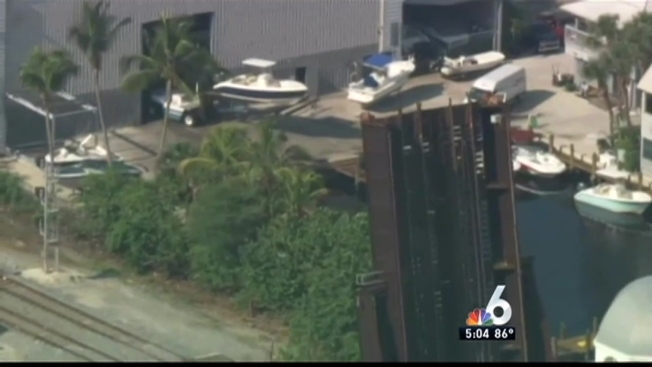 The 55 year-old Dania Beach woman was rescued from the bridge after she ended up hanging on with her hands and feet as the bridge moved into an upright position. She was participating in a breast cancer walk at the time and was only stuck for 20 minutes. "I was here that day too. This is where I live. This is my back yard," said Michael Kellett. "Why would anybody walk across a rail road bridge a draw bridge at that?"